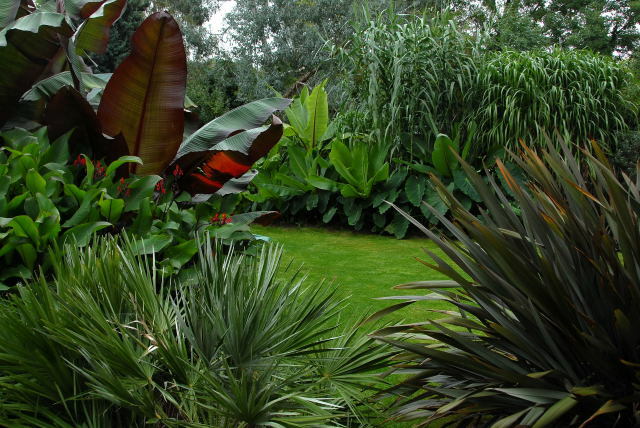 A particularly enjoyable aspect of using tropical plants as giant bedding is the option to plan a new garden layout every year. The more space you allocate to your tender tropicals, the more you can indulge your artistic tendencies. The beauty of planning a garden annually is that if certain things do not work out quite as intended you only have to wait until next year to have a go. A few years ago (early oo's) garden make-over programmes were all the rage . 90% of the time the viewer was subjected to scenes of gardeners mixing cement, laying patios and paths, sawing planks and building decks, pergolas and so on. The last 10% of the show was dedicated to adding the plants. Invariably the garden designers would proclaim: "And now for the best bit" and would set about laying the plants out then digging them in. So with topical plants you get to do the best bit every year. Perhaps the only draw back with this style of gardening is that your garden can look a little bleak in the depths of winter, but then most conventional gardens also look pretty rough at this time of year (despite what some garden magazines may have us to believe). It is also cold and dark so who really cares anyway. Of course when planning a garden you will need to include some winter or permanent structure. The fundamentals of winter interest are discussed here. Planning a garden for the up-comming season invariably begins with lessons learnt the summer before. Observing how your plants develop in different parts of the garden helps you to learn a plants strengths and weaknesses. Each year that goes by your accumulated knowledge grows and with that knowledge the ability to plan for next year becomes easier. One thing that realy helps when you are planning a garden is knowing what you will have to work with. However these plans can often be knocked sideways. The winter could be more severe than expected leading to unplanned losses. Greenhouse experiments can go wrong. Suppliers can send the wrong seeds. In this example, the previous winter had been particularly severe. All in-ground canna rhizomes had been lost apart from a few disconnected plants. 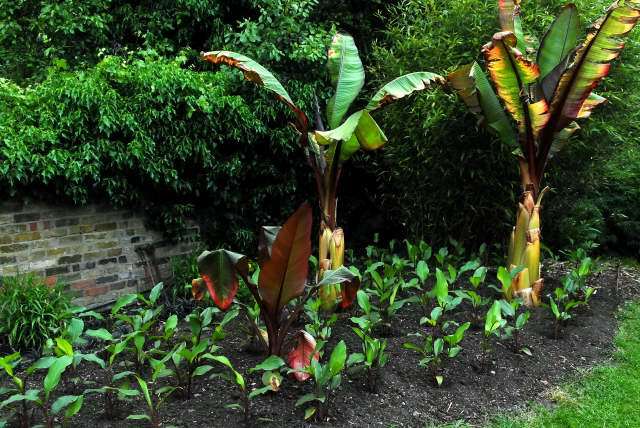 A Musa sikkimensis that had been a regular feature in previous displays was removed as it had become too familiar. All the hedychiums had survived. This left the two main planting beds free from constraints and it was decided to take the 'less is more' concept to extremes using just 4 different plant varieties. 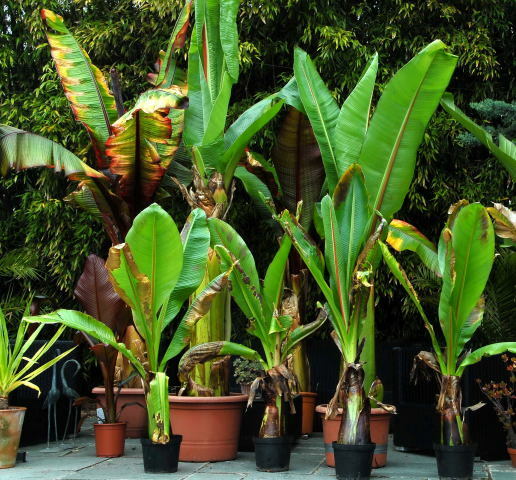 7 x green Ensete ventricosum (Abyssinian banana) of varying age and size and scruffiness. 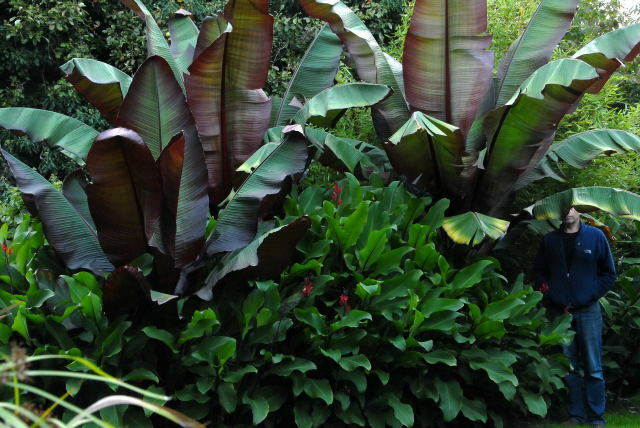 3 x red Ensete ventricosum. A three year old, a two year old and a baby to make up for the loss of two further two year olds that died in a failed experiment over winter. As soon as you know what plants you have to work with planning a garden is much easier. Once all danger of frost is over you can begin experimenting. Start with the big ones. Fortunately the large Ensete's are considerably lighter coming out of the greenhouse than they are going in. This allows you to experiment with various positionings without needing to go to hospital afterwards. When you are happy, dig in the big plants and then begin experimenting with the rest. When you are happy dig every thing in. This right hand border is shown running South to North and receives sun (when available) from midday until 6ish. The border is 2.7m (9ft) wide at its widest point. Old logs that are too big to shred are laid along the length of wall. These serve as refuges for beneficial creatures and also prevent anything from being planted too close to the wall. The rear is planted with Arundo donax and Miscanthus floridulus. In the foreground, between the Phormium and the emerging Miscanthus, are planted a group of hedychium gardnerianum. The North end of this border contains the bog garden mentioned here. 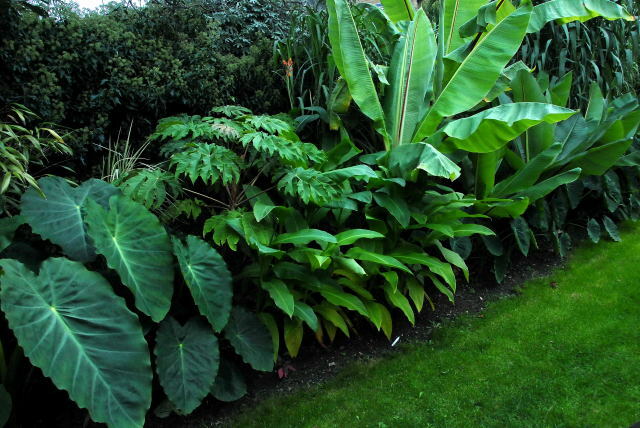 It was decided that this particular border would consist of the green Abyssinian bananas and Colocasia esculenta. Each planting hole was prepared with a mix of blended farm manure and home made compost. Take care not to plant things too close to the lawn to allow for hassle free mowing as the plants develop. When planning a garden allow for the fact that some of your plants will be somewhat sacrificial. In other words, as all the plants grow, some may find themselves in less favourable positions and gradually get shaded out. Although at the end of the season this may seem like a waste, these plants help the border to knit together faster and consequently look better sooner during the early weeks. This left hand border is on the opposite side of the garden (surprise surprise), again shown running South to North. This border receives sun pretty much all day also until about six-ish. The available planting area is approximately 2.7m (9ft) by 6 m (20ft). The only established plants in this border are (at the far end) a clump of phyllostachys bissettii (corralled with a root barrier) with a yet to emerge group of hedychium maximum planted in front (to the right) of the bamboo. Out of shot to the left a small clump of Chamaerops humilis is gradually making progress. By the way the total width of the garden is about 13m (42ft) so the two borders make up a little over 40% of the width of the garden. This allows the plants plenty of room to grow without too much pushing and shoving. 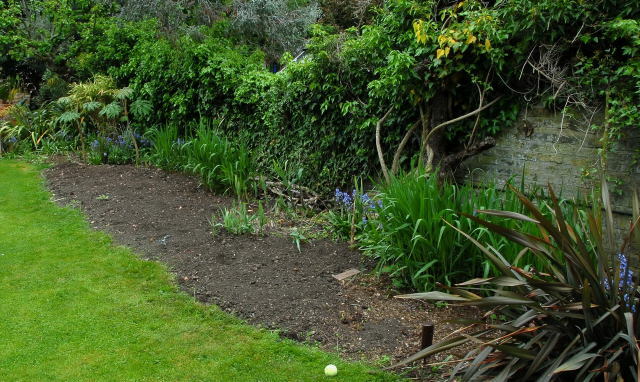 When planning a garden in a smaller or narrower space it is still important to make your borders as wide as possible. A narrow border hugging the perimeter fence or wall will not bring out the best in your plants. Plants will lean forwards to gain light. Thin borders also receive less rainfall. So in a more restricted space it is better to have one large border than two small ones. You can always have a seating area opposite in order to admire your handiwork. 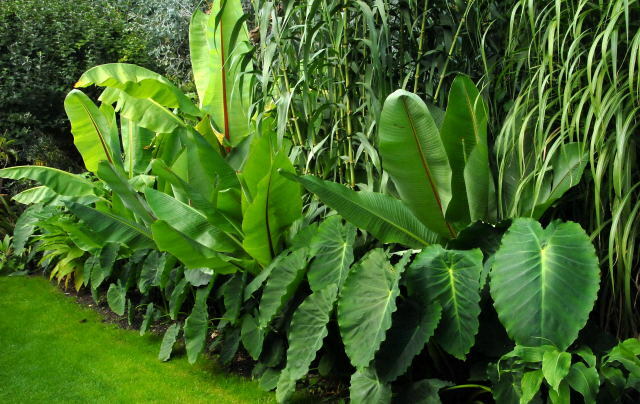 This border was reserved for the red Abyssinian bananas and canna warscewiczii. 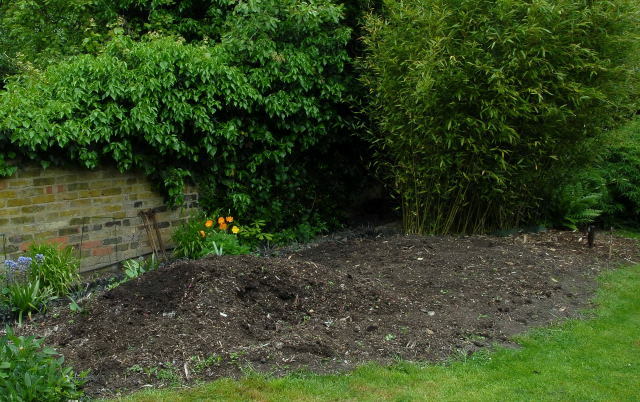 Soil preparation is essential when planning a garden and on this side consisted of simply raking the remaining home made compost over the surface of the soil. No imported manure was added. As each hole was dug the compost was mixed with the soil by default. This of course resulted in some initial weeding until the plants were able to shade out the weeds. Here is a shot for those who like a sense of scale. 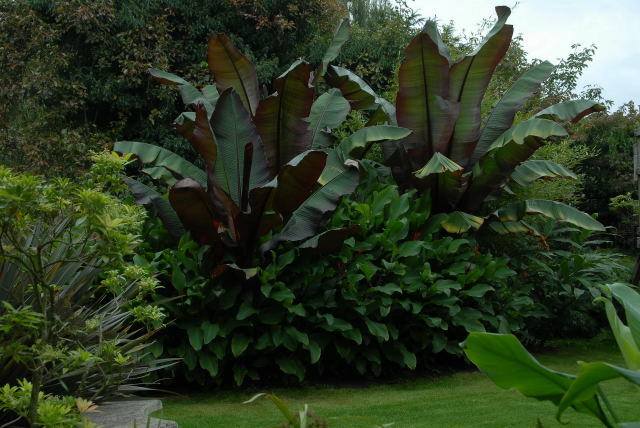 A relative lack of wind compared with the previous three years allowed the red Ensete ventricosum to gain a nice stature. 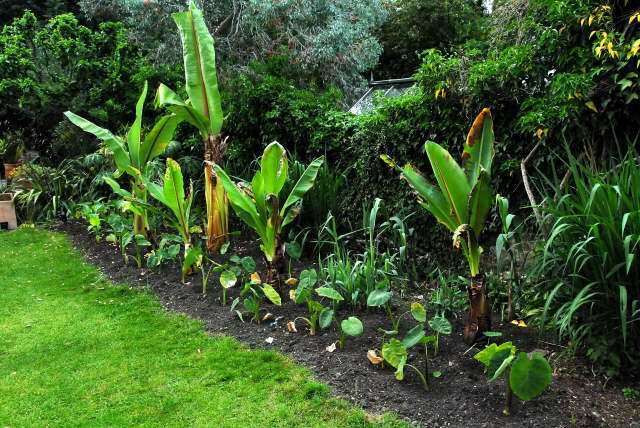 The home make compost seems to have had a favourable impact on the growth of the canna warscewiczii. After 4 months growing these were the last few days for the garden. Ten days later the first frost hit and it was all over for another year. Both borders viewed together. Ahh. In the foreground to the left is a small Chamaerops humilis and Phormium 'plats black' to the right.